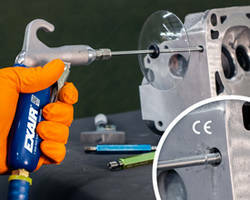 In addition to producing a cold, quiet stream of air to reduce heat buildup on machining operations, EXAIR's Cold Gun Aircoolant System(TM) has also met the rigorous safety, health, and environmental standards of the European Union in order to attain the CE mark. The Cold Gun is a low cost alternative to expensive mist systems. 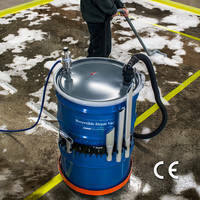 It eliminates the ongoing costs associated with the purchase, filtration and disposal of liquid coolants. 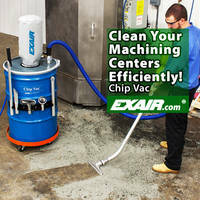 In addition, there are no worker related health problems resulting from breathing airborne coolants or slipping on wet shop floors. 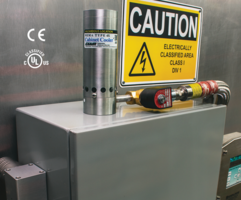 The Cold Gun Aircoolant System incorporates a stainless steel vortex tube to convert an ordinary supply of compressed air into a cold 20°F (-7°C) air stream at one end and a hot exhaust at the other. There are no moving parts to wear out. The Cold Gun now features an improved muffler on the hot air exhaust to reduce the noise level to a quiet 70 dBA. 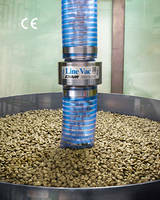 A flexible ball and socket hose that holds its position is used to direct the cold air to the point of use. A magnetic base provides easy mounting and portability. 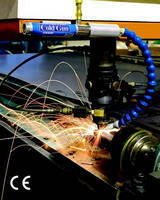 The Cold Gun Aircoolant System is non-adjustable to prevent freeze-up during continuous use. It is ideal for machining applications which include tool sharpening, drill and cutter grinding, milling, drilling, surface grinding, band sawing, plastic machining, plunge and form grinding. Prices start at $259. Safety Air Gun provides force of 13 oz to 3.3 lb. Anti-Static Air Gun carries CE, UL, RoHS certifications.